There are a number of approaches to the study of the social world that give special priority to individuals in social settings. Rational choice theory and game theory (Becker, Harsanyi) attempt to understand social outcomes as the result of the strategies and calculations of rational actors. Actor-centered sociology and pragmatist theory attempt to uncover a deep understanding of the actor’s frameworks and modes of action (Goffman, Gross). Analytical sociology attempts to work out the logic of Coleman’s boat by showing how macro-level social factors influence the behavior of individuals and how macro factors result from the interactions of individuals at the micro level (Hedstrom, Ylikoski). And agent-based models provide computational systems for representing the complex forms of interaction that occur among individuals leading to social outcomes (Axelrod, Manzo). All four approaches appear to pursue much the same basic strategy: derive social outcomes from what we know about the action models and composition of the individuals who make up a social setting. It is tempting to see these as four different formulations to the same basic approach. But this would be a mistake. At the same time, the scientific distance between Hedstrom and Goffman, or Goffman and Becker, is great. RCT, AS, and ACS bring different assumptions to the study of actors and different assumptions about what a social explanation requires. They are different research paradigms and give rise to qualitatively different kinds of research products. And ABM is a tool that can be deployed in each of these frameworks but is most suited to AS and RCT. This picture implies that the agent-centered approaches have more in common with each other than any of them do with other important strands of social science research methodologies. Can we codify these intuitions in some way? And can we sort out the logical and pragmatic relations that exist among these approaches? Here is a table that represents some of the central methodological and ontological assumptions of each of these research frameworks. Equilibrium models; commitment to mathematical solutions for well-defined problems of choice. How can we think about the relations that exist across these research approaches? Several possibilities exist. The first diagram above represents the space of research approaches to sociological topics in terms of a Venn diagram. U is the universe of research approaches. A, B, C, and D are the research approaches that fall within the rubrics of “analytical sociology”, “rational choice theory”, “actor-centered sociology”, and “agent-based models”. Each of these families of research approaches has been discussed in earlier posts, linked above. 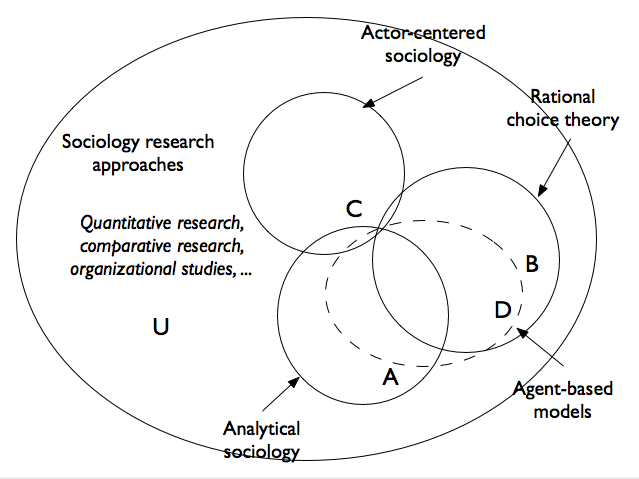 The overlaps in the sets are intended to represent the intersection between the selected groups: actor-centered approaches that use the assumptions of rational-choice theory; analytical sociology approaches that make use of actor-centered assumptions; research efforts in the three sets that make use of agent-based models; etc. The second diagram provides an initial effort to identify the distinguishing features of the several approaches as a dichotomous tree structure. AS and RCT share the microfoundations characteristic, whereas the phenomenological approach does not. The phenomenological approach emphasizes the need for a “thick” theory of the actor, whereas AS and RCT favor a thin theory. AS distinguishes the DBO assumption from the even more restrictive assumption of narrow economic rationality. And AS is more interested in identifying causal mechanisms than either alternative, whereas the phenomenological approach favors narratives and the RCT approach favors the creation of equilibrium models. The final row of this diagram provides instances of explanatory paradigms for the various approaches — Goffman’s account of the social behaviors in a restaurant, Coleman’s boat, the formal analysis of the prisoner’s dilemma, and Skocpol’s table of revolutionary outcomes. Here is another possible approach, which might be described as the “ecological” view of methodologies. In a recent post I argued that we might think of a research framework as consisting of a small set of “genes” (methodological and ontological assumptions), which then give rise to the “phenotype” of research products in the hands of groups of researchers (link). On this way of thinking, AS and RCT share a number of genes in common, and they are open to borrowing additional elements in the future through research collaboration (inter-species contact). Each shares some of the core commitments of actor-centered sociology, even as they postulate theoretical and explanatory strategies fairly distant from the key practitioners of ACS. The two “species” of research frameworks are closely related, and show promise of becoming more so in the future. But likewise, AS can become a more robust genotype for sociological research by sharing genetic components with its ecological partner, actor-based sociology. Finally, by this measure all three of these actor-based approaches are some distance from other main research approaches within sociology: survey science, quantitative research, comparative research, and organizational studies. 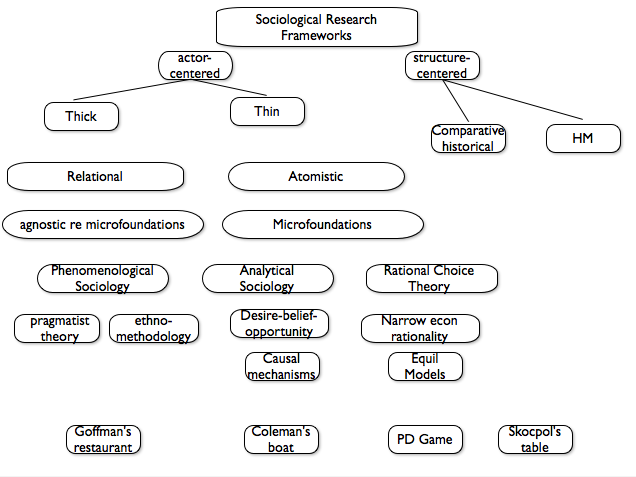 I would like to argue that analytical sociology has the intellectual breadth to encompass the core insights and methods of RCT and ACS as distinct theories of the actor, and that ABM is a formal methodology that is well suited to one component of the AS model of explanation, the aggregative component (the rising strut of Coleman’s boat). ABM is not limited to economic models of the actor and can incorporate as much detail about the actor as the modeler chooses; so ACS and pragmatist findings can be incorporated into ABM models at the possible cost of a loss of determinacy of outcome. It appears to me that agent-based models represent something different from the three frameworks considered here. ABM approaches do not inherently privilege any specific model of the actor. Most current models make use of actors who are economically rational; but it would be equally consistent to assign formal interpretations to the premises of pragmatist theories of the actor and then embody those premises within an ABM model. So ABM is a formal technique for aggregating assumptions about the actions and interactions of actors, not a substantive theory of what makes the actor tick. This observation is recorded in the Venn diagram above, with the circle representing ABM approaches overlapping will all three substantive frameworks. There is a great deal of important international work underway today within the philosophy of social science on the general topic of social ontology. How do social structures relate to the actions of socially situated actors? How does causation work in the social realm? Can we say anything rigorous about the nature of “levels” of the social world — micro, meso, and macro? And is there such a thing as an “emergent” social property or entity? The people whose work I am thinking of here are a motley group: Peter Hedstrom, Hans Joas, Petri Ylikoski, Bert Leuridan, Margaret Archer, Gianluca Manzo, Philippo Barbera, Pierre Demeulenaere, Julian Reiss, Rainer Greshoff, Dave Elder-Vass, Jeroen Van Bouwel, Mohamed Cherkaoui, … And it is roughly as challenging to keep clearly in mind the manifold debates that are unfolding as it is to watch the Indianapolis 500 as the cars rocket by at 200 miles an hour. Some of these contributors are long-established scholars with huge reputations; others are young scholars with wickedly sharp minds and awesome work habits. And frankly, I’m at least as impressed with the younger generation as the elder. One recent book that stands out as a key contribution that permits a degree of geolocation within these tangled debates is Poe Wan’s Reframing the Social: Emergentist Systemism and Social Theory. Wan seems to have read every word of the debates, and he is ready to help interested parties take stock of the various theoretical perspectives. The key axis in Wan’s work — here and elsewhere — is that defined by Niklas Luhmann and Mario Bunge on the topic of emergent social systems. Wan is persuaded that social properties are “emergent” in some important sense, and he also seems to believe that the ideas of system and complexity are important components of our vocabulary for social ontology. But how should we understand these ideas? Luhmann’s theory tends towards the position of holism, whereas Bunge’s position allows that there is an intelligible connection between upper-level properties and micro-level facts and he focuses his theory of explanation on finding underlying mechanisms of various social outcomes. Wan refers to Bunge’s approach as “rational emergentism” (68). Wan is respectful towards each of these theories, but he clearly favors that put forward by Bunge. Like Bunge, Wan too favors the focus on mechanisms; he admires Bunge’s insistence on paying attention to the details of existing research in the natural and social sciences; and most importantly, he endorses Bunge’s view that our theories of “emergent” social phenomena must be grounded in a theory of the actor. Wan also believes that Bunge’s CESM model is a helpful one for thinking about social ontology and explanation. This model incorporates composition, environment, structure, and mechanisms. For a given social entity we want to know what it is composed of; what are the features of the environment within which it functions; how is it arranged internally; and how does it work (55). Another important part of Wan’s approach is his affinity with the social theories of the critical realists — Bhaskar, Asher, Elder-Vass. Fundamentally this comes down to the view that social structures have real causal powers, along the lines of Rom Harre’s meaning of this term (110, 119, 121). Reframing the Social is an important contribution to current debates about the nature of the social. And I agree with him that the question of social ontology is a fundamental one; perhaps more so than the issues of the epistemology of the social sciences that have generally played first violin. Further, Wan does a good job of showing how these debates are relevant to the emerging framework of analytical sociology — sometimes in ways that cast doubt on some of the guiding presuppositions of that field. In particular, the aggregative strategy of explanation that is favored by AS is questionable once we give credence to the idea that social structures possess autonomous causal powers. Along with Dave Elder-Vass’s The Causal Power of Social Structures: Emergence, Structure and Agency, this book stands as an important alternative to Hedstrom’s Dissecting the Social: On the Principles of Analytical Sociology. In the same vein, Fiorina and colleagues (2005) dispute “The Myth of a Polarized America” and suggest that the “culture war” commonly conjured up in the media is a fictive construction. According to their analysis, there is no popular polarization, but simply partisan polarization—“those who affiliate with a party are more likely to affiliate with the ‘correct’ party today than they were in earlier periods” (p. 25). It is the political elite and a small number of party activists that are polarized. This all seems a little paradoxical, so it’s worth looking at the assumptions these two groups of researchers are making about “polarization”. To start, what is meant by polarization with respect to a given issue — say gay marriage? Essentially the concept is a characteristic of a population’s distribution across an attitudinal scale from strongly support to strongly oppose with respect to the issue in question. A population is homogeneous if the distribution of scores has a single peak and a small standard deviation, and is polarized if it has two (or more) peaks. Here is a diagram representing the results of their agent-based model of attitude diffusion. 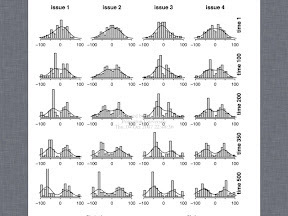 Each issue eventually shows a pronounced degree of polarization after several hundred iterations, with about half the population distributed around a positive attitude and the other half distributed around a negative attitude. Presumably we can define increase in polarization as a shift apart of the two peaks (kurtosis) and perhaps a decrease in the deviation around the peaks. Theoretically a population could be segmented into three distinct groups — perhaps one-third who cluster around the zero point of indifference and two extreme groups on the left and right. The most original part of their work here is an effort to model the emergence of issue polarization based on a theory of how social interactions in networks and small groups influence individuals’ attitudes. 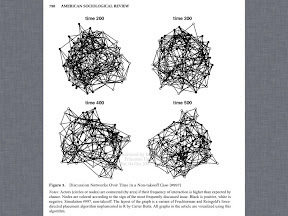 They offer a sociological theory of inter-personal influence to explain how attitude diffusion occurs within a population, and they report the results of network simulations to illustrate the consequences of this theory. They argue that this model explains how members of society can perceive polarity while actually embodying a high degree of homogeneity. The simulations are very interesting. The authors specify assumptions about the structure of interactions; they specify how an individual’s attitude is affected by the interaction; and they creat an initial distribution of attitudes for the 100 actors in the simulation. They then run the set of actors and interactions through 500 iterations and observe the resulting patterns of distribution of attitudes. The cases resolve into two large groups: non-takeoff, where polarization does not emerge and takeoff, where polarization does occur. The first group is much more common, validating the prior finding that public opinion is not becoming more polarized. The “takeoff” group is much less common but important. For some initial distributions of attitudes and interaction pathways the population does develop IMO two sharply divided sub-groups. These two diagrams illustrate these two possibilities. Several things are striking about this work. First is the degree to which it presents a picture of public opinion that seems highly counterintuitive in 2012. The first half of their paradox seems even more compelling today than five years ago — the American public does seem to be very divided in its opinions about social and moral issues. The second striking thing is perhaps an omission in the foundations of their theory of attitude formation. Their model works through 1-1 interactions. But it seems evident that a lot of attitude formation is happening through exposure to the media — television, radio, Internet, social media. There doesn’t appear to be an obvious way to incorporate these powerful influences into their model. And yet these may be much more influential than 1-1 interactions. Does the microfoundations principle imply reductionism? My philosophy of social science has always and consistently maintained the idea that social facts depend on the activities and beliefs of individuals. There is no social “stuff” that exists independently from individual actors. I have encapsulated that idea in the form of the “microfoundations” principle: any claim about the characteristics or causal powers of social entities must be compatible with there being microfoundations for those properties and powers at the level of the actor. At the same time, I also believe that there is an appropriate domain for social science: the exploration of the features and powers of the social world. I don’t believe that methodology should force the sociologist to become a psychologist or to shift his/her attention to the micro level. Are these two premises compatible? Or does the microfoundations principle actually entail reductionism? Does it imply that explanations couched at the level of social vocabulary are incomplete and derivative, and that the real explanation must be found at the level of the micro-activities of individuals? I attempt to resolve this apparent dilemma by distinguishing between strong and weak versions of the microfoundations principle: “social explanations must provide microfoundations for their assertions about social properties and powers” versus “social explanations must be compatible with there being microfoundations for their assertions about social powers and properties.” The weak version reflects an appropriate stipulation based on what we know about the ontology of the social world, whereas the strong version is a kind of explanatory reductionism that is unjustified. My position, then, is that sociology is a special science in Fodor’s sense, and that sociologists both can and do treat their domain as relatively autonomous. Several commentators allege that my commitment to microfoundations — which is unwavering — vitiates my ability to claim relative explanatory autonomy for the meso level. Some don’t like my distinction between weak and strong microfoundations, and others think that commitment to MF means explanations have to proceed through explicit discoveries of the MF pathways. My position is intended to exactly parallel physicalism in cognitive science: we are committed to the idea that all cognitive processes are somehow or other embodied and carried out by the central nervous system. But we are not obliged to actually perform that reduction in offering a hypothesis and explanation at the level of cognitive systems. Even more prosaically: we believe that the properties of metals depend upon the quantum properties of subatomic particles. Does anyone seriously believe that civil engineers aren’t giving real explanations of bridge failures when they refer to properties like tensile strength, compression indices, and mechanisms like metal fatigue? We can observe and measure the metal’s properties without being forced to provide a quantum mechanical deduction. One observer writes that “Little’s examples actually confirm that meso-level mechanisms work only through micro-level processes.” Yes, and I likewise confirm that cognitive processes work only through neural events and material properties work only through quantum physics. But I don’t accept that this demonstrates that the higher level cannot be treated as having real causal properties. It does have those properties; and we simply reaffirm the point that somehow or other those properties are embodied in the lower level elements. This isn’t a new idea; it was contained in Jerry Fodor’s “Special Sciences” article years ago. If the argument is generally a bad one then we are forced to undo a lot of work in cognitive science. If it is generally compelling but inapplicable to social entities then we need to know why that is so in this special case of a special science. To be clear, I too believe that there is a burden of proof that must be met in asserting a causal power or disposition for a social entity — something like “the entity demonstrates an empirical regularity in behaving in such and such a way” or “we have good theoretical reasons for believing that X social arrangements will have Y effects.” And some macro concepts are likely cast at too high a level to admit of such regularities. That is why I favor “meso” social entities as the bearers of social powers. As new institutionalists demonstrate all the time, one property regime elicits very different collective behavior from its highly similar cousin. And this gives the relevant causal stability criterion. Good examples include Robert Ellickson’s new-institutionalist treatment of Shasta County and liability norms and Charles Perrow’s treatment of the operating characteristics of technology organizations. In each case the microfoundations are easy to provide. What is more challenging is to show how these social causal properties interact in cases to create outcomes we want to explain. The best reason I am aware of to doubt stable causal powers for social entities is founded on the point that organizations and institutions are too plastic to possess enduring causal properties over time. I’ve made this argument myself on occasion. But researchers like Kathleen Thelen in The Evolution of Institutions demonstrate that there are in fact some institutional complexes that do possess the requisite stability. So I continue to believe both things: that statements about social entities and powers must be compatible there being microfoundations for these properties and powers; and that it is theoretically possible that some social structures have properties and powers that are relatively autonomous, in the sense that we can allude to those properties and powers in explanations without being obliged to demonstrate their microfoundations. A very interesting and current sociological study of “meso”-social causation can be found in the literature on neighborhood effects over the past 15 years or so. Robert Sampson and various colleagues have offered striking new analyses and arguments that establish the importance of geo-social neighborhoods on the occurrence of a variety of important social behaviors. And their thinking represents a concrete, empirically rigorous and theoretically well developed effort to probe the effects and mechanisms that link neighborhood to resident. Sampson, Morenoff and Gannon-Rowley provide a review of this literature in “Assessing ‘Neighborhood Effects’: Social Processes and New Directions in Research” (link). Sampson’s contribution to the Demeulenaere volume, Analytical Sociology and Social Mechanisms , makes explicit the connection of this line of argument to issues about causation and methodological individualism that have been important to the analytical sociology movement. What Sampson and his co-authors want to discover is how sociologists have begun to identify and measure features of “neighborhoods” that are not simply aggregate features of individual behaviors, and how they have attempted to identify causal relations between these meso-level neighborhood characteristics and individual-level behaviors and outcomes. They are particularly interested in health outcomes and other forms of disadvantage for children and adolescents, or what they term “problem-related or health-compromisingbehaviors among children and adolescents” (448): “infant mortality, low birthweight, teenage childbearing, dropping out of high school, child maltreatment, and adolescent delinquency” (446). A more recent contribution from Sampson appears in the Demeulenaere volume discussed in several earlier posts, Analytical Sociology and Social Mechanisms . The essay is called “Neighborhood effects, causal mechanisms and the social structure of the city,” and it makes an explicit attempt to line up the neighborhood-effect literature with some of the issues of analytical sociology. Most important is the fact that neighborhood effects are thought to be “emergent” or autonomous with respect to the individual characteristics of the people who make up the population. Sampson’s effort in this essay is to give a satisfactory definition of “neighborhood,” to indicate some ways of measuring or describing neighborhood-level properties (what he refers to as “ecometrics”, in analogy with “psychometrics”), and to reflect on some possible mechanisms that might work from this level of analysis to the individual level of the people who make up the neighborhood. Sampson explicitly parts company with “Coleman’s boat”, offering a multi-level and multi-dimensional causal model of “neighborhood structure, social-spatial mechanisms, and crime rates” (Figure 11.1; 236). Sampson’s work, with a handful of different collaborators, is a very impressive example of the possibility of bringing together very rigorous quantitative methods with a social realist’s interest in causal mechanisms and a non-reductionist’s willingness to assign causal powers to supra-individual structures and conditions. 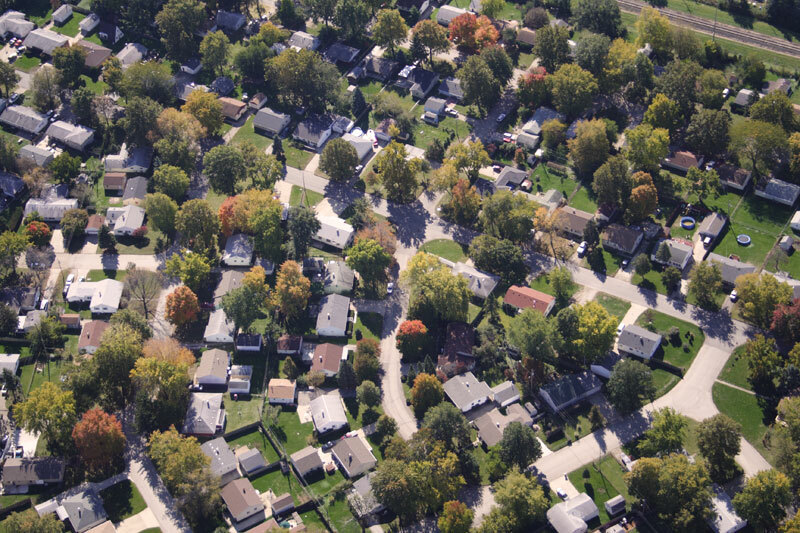 The systematic effort to introduce methods for observing and measuring “neighborhood-level” characteristics — what they call ecometrics — is a valuable addition to the toolbox for sociological analysis at a range of levels of social activity. Many of these issues are presented in greater detail in Sampson’s very interesting book, Great American City: Chicago and the Enduring Neighborhood Effect . It is this structure which corresponds to the two transitions I have described: macro to micro and micro to macro. The first of these transitions is mirrored in the player’s interests, given by the goal established by the rules; the constraints on action, which are imposed by other rules; the initial conditions, which provide the context within which action is taken; and after the game is in play, the new context imposed by others’ actions. The second transition is mirrored by the consequences of the player’s action: how it combines with, interferes with, or in any other way interacts with the actions of other …, thus creating a new context within which the next action takes place. Type 4 connections — macro to macro — are ruled out (“the macro level is an abstraction, nevertheless an important one”; Coleman 12); so causal influence for macro factors can only work through disaggregated effects at the micro level. We might refer to Type 3 connections as aggregative, and Type 2 as formative; Type 3 represents the composition of the macro-level effect through the activities of individuals at the micro-level. And Type 2 represents the “shaping” or “forming” of individuals that occurs when a macro-level entity affects them — schools, norms, institutions. Type 1 are connections within the individual’s psychology and agency. Udehn characterizes Coleman’s position as “structural individualism” (304). What does he mean by this? Here is a brief explanation. He begins by characterizing “institutional individualism,” which is itself a loosening of methodological individualism away from the strictures of psychological individualism. Here the distinctive idea is that “the behavior of the social system is the aggregated result of the actions of individuals, or the resultant of their interaction.” He then characterizesstructural individualism in these terms. 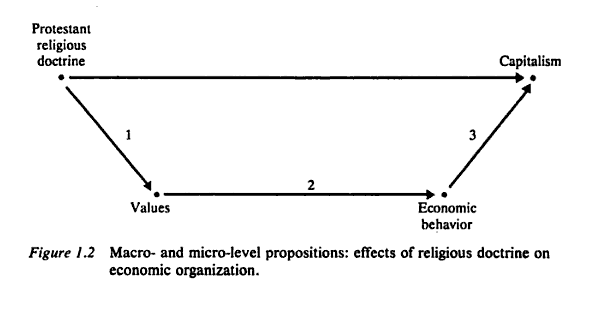 So according to Udehn’s interpretation, Coleman diverges from strict methodological individualism in that he admits the “structural” effects of organizations and positions within them: that these system-level characteristics have effects on social behavior at the individual level that are different from the mere aggregation of independent interests among individuals. Further, Udehn highlights the fact of socialization: the fact that individuals are socialized by macro-institutions, with the result that their behavior at the micro level is already conditioned by features of the macro value system — ways of thinking, ways of valuing, ways of interpreting. “Every individual living in society is socialised and internalises, in varying degrees, the values and beliefs prevailing in the society, or group, to which he/she belongs” (301). What I have objected to in this picture, without formulating it very clearly, is that it seems to require social explanations to proceed through the actions of individuals. Essentially it seems to imply that only agent-based simulations will provide acceptable explanations of “macro-macro” effects; which means that we are compelled to give up the Type 4 (macro-macro) explanation in favor of a trip through Coleman’s boat, formalized with an agent-based simulation. The position I would like to defend is two-fold and is a defense of Type 4 explanations. First, macro entities (organizations, institutions, normative systems) have stable characteristics with behavioral consequences. Second, those entities must have microfoundations; we must be confident that there are individual behaviors at lower levels that support these macro characteristics. But third, it is legitimate to draw out the macro-level effects of the macro-circumstance under investigation, without tracing out the way that effect works in detail on the swarms of actors encompassed by the case. I’ve referred to this possibility as “relative explanatory autonomy” of the meso-level (link, link, link). And the requirement of microfoundations is not a requirement on explanation; it does not require that our explanations proceed through the microfoundational level. Rather, it is a condition that must be satisfied on prima facie grounds, prior to offering the explanation. Elster is not only a proponent of rational choice, but of methodological individualism as well, and he seems to share the common presumption that the two are inseparably linked. By ‘methodological individualism’, Elster means ‘the doctrine that all social phenomena — their structure and their change — are in principle explicable in ways that only involve individuals — their properties, their goals, their beliefs and their actions. Methodological individualism thus conceived is a form of reductionism. Neil Gross offers a friendly amendment to the growing literature on social mechanisms within sociology in “A Pragmatist Theory of Social Mechanisms” (link). He offers general support for the framework, but criticizes the main efforts at specifying what a social mechanism is. (James Mahoney makes a major effort to capture the main formulations in “Beyond Correlational Analysis”; link. Mahoney identifies 24 statements, all somewhat different.) Gross argues that the existing formulations are too tightly wedded to the metaphor of a physical mechanism — for example, the cogs, gears, and springs of a clock. And the existing frameworks are too dependent on the assumption of rational actors, rather than a more fluid and relational understanding of social action. In some respects his arguments converge with those of Andrew Abbott considered in an earlier post. The account of social mechanisms that Gross puts forward is a “pragmatist” theory. Here is how he puts the point in the paper’s abstract. A key part of Gross’s critique of existing expositions of the social mechanisms approach, largely within the framework of analytical sociology, is the reliance these researchers make on the framework of rational choice theory. Gross believes this is too narrow an understanding of human action, and therefore serves poorly as a foundation for our thinking about real social mechanisms. Gross prefers a “pragmatist” understanding of action and actors, one that is closer to the field of symbolic interactionism than to economics. This approach links action to “practices” and habits more fundamentally than to means-end rationality and goal-seeking behavior. “Pragmatists maintain that instrumental rationality itself, when it does appear, is a kind of habit, a way that some humans can learn to respond to certain situations, and that we should be as interested in the historical processes by which the habit of rationality — in its various forms — develops and is situationally deployed as we should be in its effects” (367). Fundamentally Gross’s critique comes down to a plea for a better understanding of social action itself, and of the actor, than the mechanisms approach is inclined to offer. And the framework within which to conceptualize action that he prefers is one that derives from inter-action, spontaneity, and adjustment as much as (more than?) the deliberative and calculating processes postulated by rational-actor models. I think that Gross’s approach is fairly consonant with that taken by Chuck Tilly and Doug McAdam in various places. McAdam, Tarrow and Tilly emphasize the “relational” nature of social action in Dynamics of Contention. And here is a nice statement of McAdam’s summary view of social action in Political Process and the Development of Black Insurgency, 1930-1970 . This account emphasizes much of Gross’s agenda as well: adaptiveness, contingency, a fluid definition of action through inter-action with other actors, and the significance of culture and identity in action. To explain a social outcome or regularity, we need to provide an account of why and how it came about; and this means providing a causal analysis in terms of which the explanandum appears as a result. 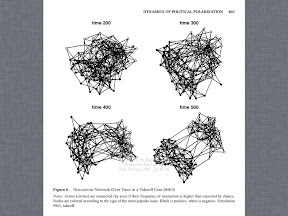 This entails, basically, that we need to understand all higher-level social entities and processes as being composed of the activities and thoughts of individual agents at a local level of social interaction; we need to be attentive to the pathways of aggregation through which these local-level activities aggregate to higher-level structures; and we need to pay attention to the iterative ways in which higher-level structures shape and influence individual agents. Social outcomes are invariably constituted by and brought into being by socially constituted, socially situated individual actors (methodological localism). Both aspects of the view are important. By referring to “social constitution” we are invoking the fact that past social arrangements have created the social actor. By referring to “social situatedness” we invoke the idea that existing social practices and rules constrain and motivate the individual actor. So this view is not reductionist, in the sense of aiming to reduce social outcomes to pre-social individual activity. We also want to refer to supra-individual actors — firms, agencies, organizations, social movements, states. The social sciences are radically incomplete without such constructs. But all such references are bound by a requirement of microfoundations: if we attribute intentionality to a firm, we need to be able to sketch out an account of how the individuals of the firm are led to act in ways that lead to the postulated decision-making and action (link). So, then: what is involved in asserting that social circumstance A causally produces social circumstance B? There are, of course, numerous well developed answers to this question: statistical inference based on correlations of occurrences, conditional probabilities, and necessary-sufficient condition analysis. My view, however, is that there is a more basic meaning of causation: A caused B iff there is a sequence of causal mechanisms leading from A to B. This approach is especially suitable for the social realm because, on the one hand, there are few strong statistical regularities among social outcomes, and on the other, it is feasible to identify social mechanisms through a variety of social research methods — comparative analysis, process tracing, case studies, and the like. Several social scientists have anticipated this approach through their own concrete analysis of aggregation phenomena. A good illustration is Thomas Schelling. His work presents a large number of examples of mundane social outcomes that he explains on the basis of simple individual-level choices and an aggregation mechanism (Micromotives and Macrobehavior , Choice and Consequence ). Features of organized crime, traffic patterns, segregation, and dying seminars all come in for treatment. Schelling demonstrates in concrete terms what sorts of things we can identify as “social mechanisms” and traces them back to the circumstances of action of individuals in social situations. Another important methodological question for this approach to social explanation is the issue of explaining general statistical patterns in social life. What if we want to explain something more quantitative — say a gradually rising divorce rate or the finding that co-habitants before marriage have higher divorce rates than non-co-habitants? On the social mechanisms approach, we would want two things. First, we would like an agent-level mechanism that explains the statistic; and second, we would like to find a common cause if the phenomenon is similar in several countries. Finally, the actor-based mechanisms approach invites an area of study which is now being referred to as “aggregation dynamics” (link, link). We need to have theories and tools that permit us to aggregate different micro-level processes over time into meso- and macro-outcomes, taking into account the complexity of causal interactions in a dynamic process. The tools of agent-based modeling are relevant here (link).